For weddings and large events, we welcome you to book a tasting or consultation. We will take down some initial information, and together we will come up with the perfect design for your cake, cupcakes or sweets table. During this time we will discuss pricing, a design will be provided and you’ll be sent home with a quote or of course the option to book your date. The tasting will commence after all the details have been discussed. Because of spacing in the store, we only allow 2-3 people per tasting. how much does it cost & whats included? Consultations are offered free of charge. We will discuss details and you’ll be sent home with a quote and design. If you’d like to book the date, we require a 50% deposit. If you'd like to book a tasting, there will be a $35.00 fee. This includes the consultation as well as a sampling of 5 of our most popular cake flavours. Flavours include: vanilla with vanilla bean buttercream, red velvet with a cream cheese buttercream, lemon with a raspberry buttercream, marble with salted caramel buttercream and chocolate with chocolate buttercream. DO YOU HAVE GLUTEN FREE, VEGAN or dairy free OPTIONS? Yes we do gluten free cake tastings. You’ll be provided with chocolate and vanilla gluten free batters & buttercream samplings of vanilla, chocolate, cream cheese, raspberry & salted caramel. There will be a charge of $40 for all gluten free tastings, $35 of which will be applied to the balance of your order if you choose to book our services. We do not have vegan or dairy free options. 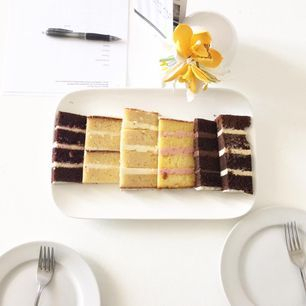 Yes, we offer custom cake tastings. You may choose 5 options of batter and buttercream flavours from our menu. There will be a charge of $40 for all custom tastings, $35 of which will be applied to the balance of your order if you choose to book our services. FLAVOURS OF THE CAKE SAMPLES? We encourage you to bring any ideas, inspiration, pictures, samples of your colours, florist information, venue information & cake topper ideas are all appreciated for inspiration and colour matching. This helps to speed up the consultation part of the tasting. Also, bring your appetite!